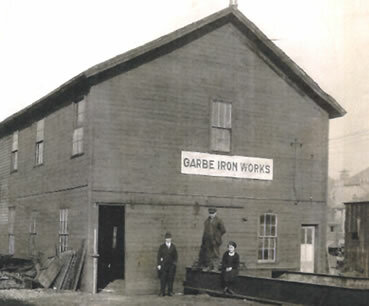 Garbe Iron Works, Inc. was founded in 1919 by Frank B. Garbe. The company operated in various sites around Aurora for the next 31 years. In 1950 Mr. Garbe acquired the land at 500 North Broadway and built the first building and subsequently 12 additions which eventually resulted in a 27,000 sq. ft. fabrication facility by 1973. During this period of growth Mr. Garbe’s son, F. James Garbe, became President and guided the expansion. In 1976 the current 45,000 sq. ft. Steel fabrication building was put into operation and was one of the most advanced steel fabrication shops in the area with a material handling system that was rare for its time. Over the next few years the American Institute of Steel Construction based in Chicago, regularly brought foreign trade delegations from a number of countries by GIW to view the ultimate in structural steel fabrication facilities. With an annual capacity of over 5000 tons, we continue to meet the quality and schedule requirements of many repeat clients throughout the upper Midwest, including other fabricators for whom we do considerable subcontract work. We offer single-point responsibility for the entire “Division 5” scope of the project, including fabrication and erection of the structural steel, joist, deck and miscellaneous metals. This single-point responsibility reduces the coordination and scheduling efforts of the client and insures that the client always knows who is responsible for their project. Our services are designed to insure on time completion of every project. GIW welcomes fabrication work ranging from as little as 1 ton to over 1000 tons. GIW on the forefront of technological advances for the past 40+ years. View structural steel fabrication projects completed by GIW.